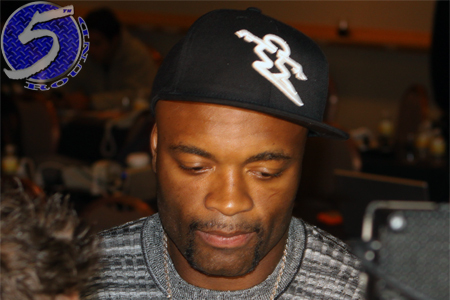 Former UFC middleweight champion Anderson Silva (pictured) was rushed to a local Las Vegas hospital immediately after snapping his left shin in two against Chris Weidman at UFC 168. Silva underwent successful surgery, which was performed by the UFC’s orthopedic surgeon, Dr. Steven Sanders. Sanders inserted an intramedullary rod into Silva’s left tibia. His broken fibula was stabilized and does not require a separate operation. The 38-year-old Silva will momentarily remain in the hospital for observation, but no additional surgery is required at this time. Recovery from such injuries typically vary between three to six months. Silva later took to Twitter and apologized to his country for his loss. “Brazil I’m sorry to have disappointed you. Did not want to. Give my best I swear,” Silva wrote. After nearly getting TKO’d in the opening round, Silva started to open things up in the second stanza. Weidman checked a kick and Silva’s shin snapped instantly. The fight was stopped immediately. Silva’s leg was put in a split and he was carried out of the Octagon on a stretcher. He was heard screaming in agony when arriving backstage.